To stay in Barcelona without visiting Casa Batlló is like being in Paris and forgetting about the Eiffel tower, with all due respect to Sagrada Familia and Sacre Coeur respectively. The famous house designed by Gaudi is so, let's say, 'different' that tiptoeing her is almost a sacrilege. Besides the exquisite trencadis (shattered tiles) on the façade, the balconies are like carnival masks, concealed faces watching upon passersby. The whole building has more to do with patterns we usually find in nature than with man's rationale, like the peculiar contours of the roof that simulate some sort of scaly skin as that of a lizard or a snake, or why not, a dragon, or the impossible arches and oval windows in the lower floors deprived of everything that recalls a straight line. I tried to apply some symmetry at the moment of framing the picture but it was certainly pretty hard. 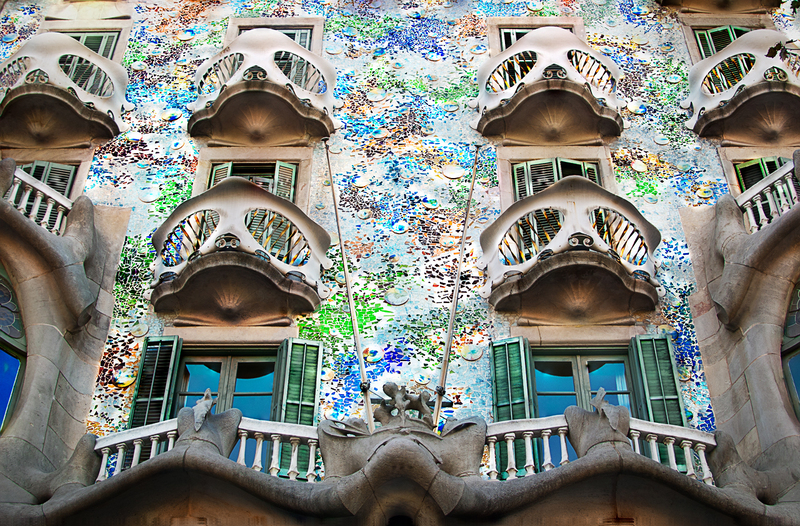 Here is a previous post about Casa Batllo. Mira que es de maca! Looks as if they were able to speak. Muito bom conhecer o seu ótimo blog. I love this building. It's so unique, the shapes and colours are delightful and it looks beautiful when it's illuminated too. I've never managed to see inside it though. Is it open to the public regularly or only on the feast of La Merce? Well open it is but not for free that's for sure. It is very rare that they accept free entrance. Although there is city hall ruling to open museums once a month to the general public for free, I have to say that maybe it is not the case of Casa Batllo but don't take my word on that. I have seen photos from this house before. It is really an artwork and totally unique. I hope I get to see it in real life sometime! That looks fantastic. If and when I visit I will stop by here, that's for sure.